A glass ceiling is a political term used to describe « the unseen, yet unreachable barrier that keeps minorities and women from rising to the upper rings of the corporate ladder, regardless of their qualifications or achievements. source : Federal Glass Ceiling Commission. Solid Investments : Making Full Use of the Nation’s Human Capital. Washington, D.C.: U.S. Department of Labor, November 1995, p. 4. 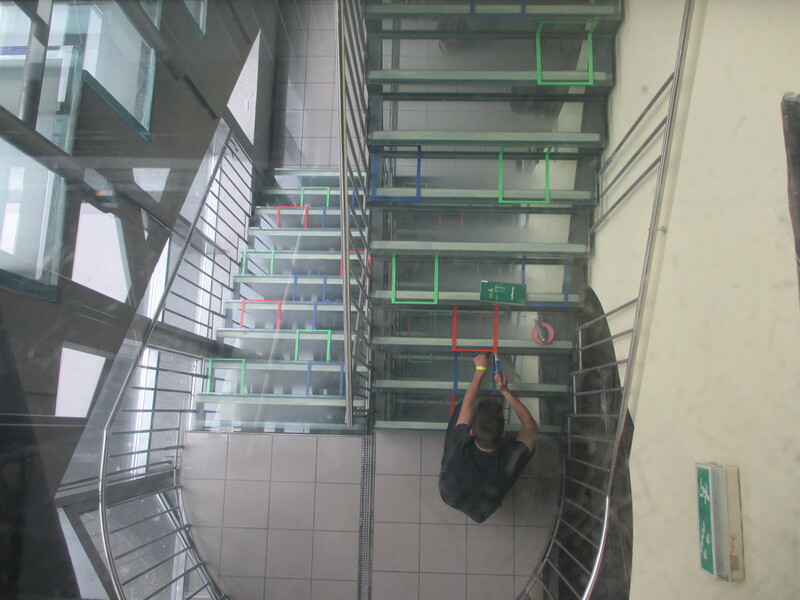 This installation is an evocative way to point gender inequality through a playful process in public space to be played in stairs. 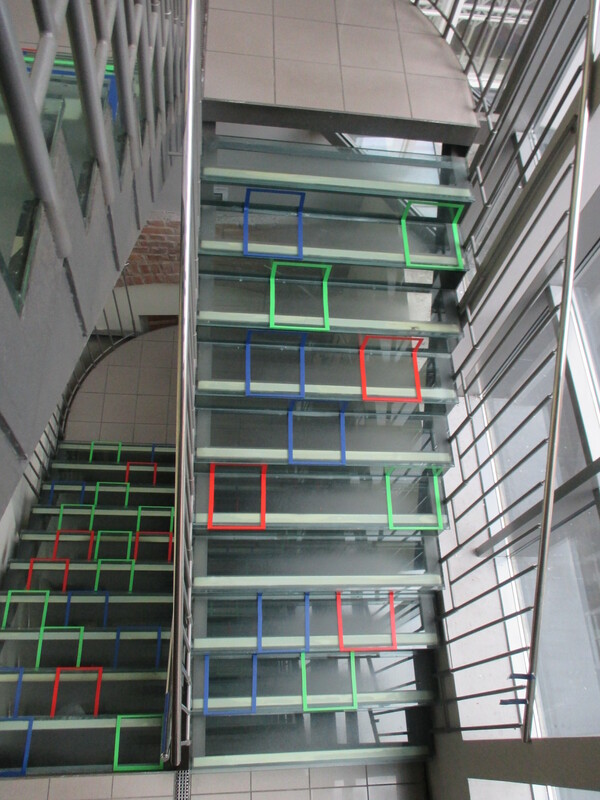 Glass Celling is composed of a colored stairway and only requires a single foam dice. The objective of this competitive/evocative game which symbolizes social mobility is to reach the top cell. The game differs according to your gender. The first player who reaches the top win the game. Cells have 3 different colors (i.e blue, red, green). Each stair is marked by one or multiple cells. One cell can host only one player. At first players gather at the bottom of the stairway. To define who will start, players will be asked to announce their age and the dice will be rolled by the oldest player (and so the youngest, will be the last one). A-If there is a free cell – a red one for women, a blue one for men, a green one for both – she/he can stay. B-If there is no free cell, she/he must go to the first unoccupied cell under the one the player should have reach. C-If SHE reaches a blue cell, she must find the first red or green cell unoccupied under the one she should have reach. If HE reaches a red cell, he must find the first blue or green cell under the one he should have reach. When HE/SHE reaches a free cell, the active player is now the first player below who was’nt passed over this turn (except if he/she is the last player in the staircase). When HE/SHE cannot positioned on a new free cell this turn, or if the reached cell is bellow all other players, HE/SHE losts the dice and gives it to the first player above him who becomes the active player. GLASS CELLING IS YOURS ! According to the location and duration of the installation, paint, gaffer tape, chalks, etc could be used. This game has been tested in public space in France (as a prototype in Nantes and during ZLT in Saint-Denis) and in Poland (Playpublik festival in Krakow). It has been thought as a critical device : its basic pattern allow every one to reuse it to point any kind of inequality or statistic issue. Dcalk releases Glass Celling under a Creative Commons licence so to invite any one to create its own version. Glass Celling de Dcalk est mis à disposition selon les termes de la licence Creative Commons Attribution – Partage dans les Mêmes Conditions 4.0 International. Fondé(e) sur une œuvre à https://leschiensdelenfer.org/interventions/glass-celling/. Find here the Pdf with the rules in english, hopefully soon translated in other languages.